This is a really interesting book for people who are in a senior leadership position, it shows that any company can be great if they identify what they are good at and they focus solely on that. The book also highlights that this is not an easy of quick transformation taking year (or decades) to get the company doing the things which its good at and improving on it. These are people who are passionate about the company and not about themselves. Prepared to make the right decisions for the company no matter how hard. Looks at windows to praise others and mirrors to blame themselves – taking full responsibility. Teams who debate productively in search of the right answer and once they find it commit to it, regardless of personal interests. Compensation is only to keep the right people and not to motivate meaning that great companies did not pay more than good ones. The “right” person is more about character traits and innate capabilities than with specific knowledge, background, or skills. Confront your reality, honestly and with diligence to uncover the truth. 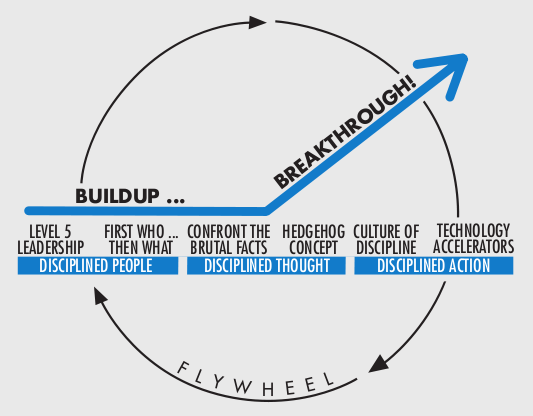 The hedgehog is an understanding strategy of what the company can be the best in the world at, not necessarily what it wants to be the best at. 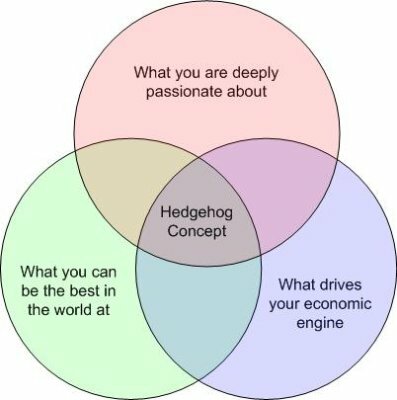 If you can not be best in the world at your core bussiness then that can not be your hedgehog concept. The “best in the world” understanding is a much more severe standard than a core competence. 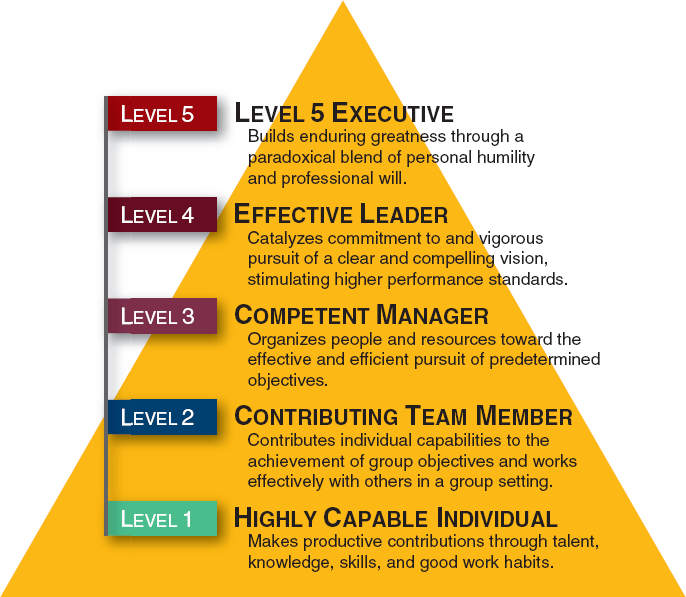 You might have a competence but not necessarily have the capacity to be truly the best in the world at that competence. Conversely, there may be activities at which you could become the best in the world, but at which you have no current competence. After following the steps it is key to keep doing them, small increments add to big benefits. The companies which keep changing direction effectively keep growth down where as if they kept the fly wheel going they would have achieved far superior results.